Driven by lower prices of radio-frequency identification (RFID) tags, and increasing penetration of RFID technology in various industries, the RFID market is likely to witness high growth in coming years. The RFID market was valued at USD 16.95 Billion in 2016 and is expected to grow at a CAGR of 7.7% between 2017 and 2023. The base year considered for the study is 2016, and the forecast period is between 2017 and 2023. The objective of the report is to provide a detailed analysis of the RFID market based on products and tag market based on wafer size, working, frequency, applications, form factor, label type, and region. The report provides detailed information regarding the major factors influencing the growth of the RFID market. The report also provides a detailed overview of the value chain of the RFID market. 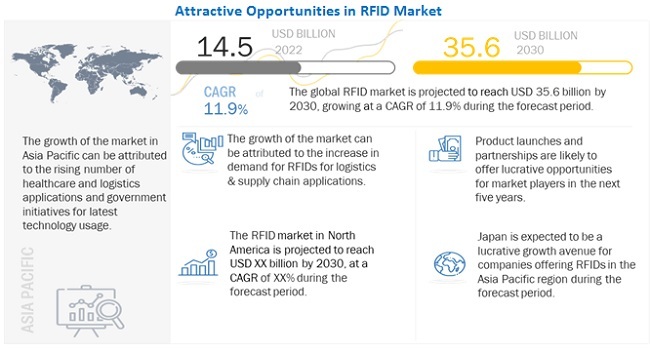 The research methodology used to estimate and forecast the RFID market begins with obtaining data through secondary research such as RetailWire, RFID Journal, and the newsletters and whitepapers of the leading players in this market. The offerings of the tags, chips and software providers have also been taken into consideration to determine the market segmentation. The bottom-up procedure has been employed to arrive at the overall size of the RFID market from the revenue of key players. After arriving at the overall market size, the total market has been split into several segments and sub segments, which then have been verified through primary research by conducting extensive interviews with officials holding key positions in the industry such as CEOs, VPs, directors, and executives. The market breakdown and data triangulation procedures have been employed to complete the overall market engineering process and arrive at the exact statistics for all segments and sub segments. The breakdown of the profiles of primaries has been depicted in the following figure.